Blowout Sale! 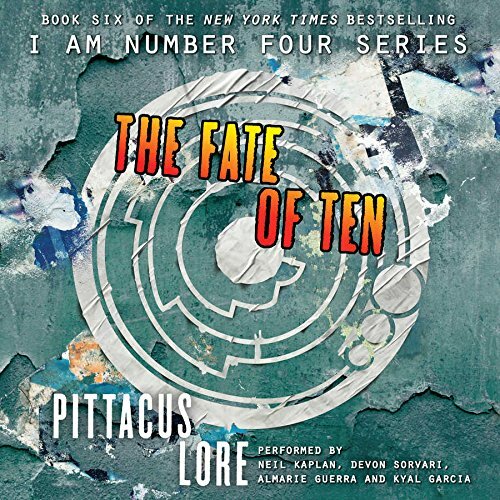 Save 51% on the The Fate of Ten (Lorien Legacies, Book 6) (I am Number Four) by HarperCollins Publishers and Blackstone Audio at Spring Brook Audio. Hurry! Limited time offer. Offer valid only while supplies last. [Young Adult Fiction (Ages 12 - 17)]For years the Garde have fought the Mogadorians in secret. Now all of that has changed. The invasion has begun. For years the Garde have fought the Mogadorians in secret. Now all of that has changed. The invasion has begun. If the Garde can't find a way to stop the Mogs, humanity will suffer the same fate as the Lorien: annihilation. But there is still hope. When the Elders sent the Garde to Earth, they had a plan-one which the Garde are finally starting to understand. In the climax of The Revenge of Seven, a group of the Garde traveled to an ancient pyramid in Mexico known to their people as the Sanctuary. There they awoke a power that had been hidden within our planet for generations. Now this power can save the world â¦ or destroy it.